An unexpected package arrived in the mail the other day, and when I opened it, I found a note from my best friend in high school and an envelope full of pictures of us back in the day. 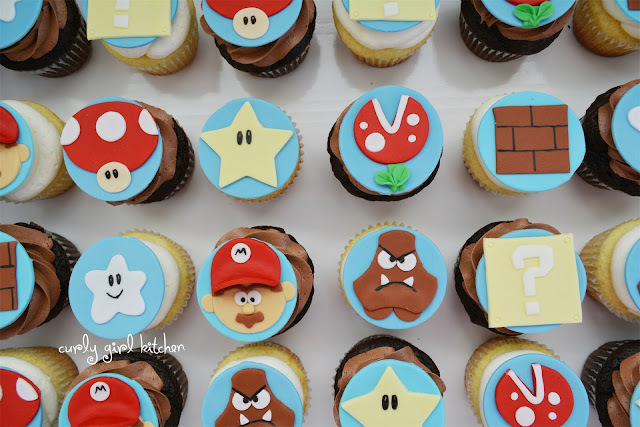 Between the 20-year old photos and the Mario Brothers cupcakes I was working on, so many memories flooded over me. My brother used to have the old Nintendo when we were kids, and I remember thinking how silly the game was, and how annoying the sounds were. I don't think I ever played it even once, since I far preferred to play with my dolls, Barbies, or kitchen set, sew things from my mom's fabric scraps, draw, paint or read a book. I liked to read so much, in fact, that even when I had a friend over to play, I would sometimes get tired of whatever we were playing and sit down on the floor in my bedroom, my back against my bed, and a stack of books next to me. This led her to go tattle on me to my mom, who then informed me that I needed to pay attention to my friend since she was our guest. But all I could think was, why can't she read a book, too? What's wrong with us reading books together? Why does she need me to constantly entertain her? Clearly, we were not destined for best-friendness. A fact that was solidified in my mind as she danced around me on the dusty playground during gym class, taunting me and chanting "ten-times-ten-plus-ten, ten-times-ten-plus-ten", over and over and over. And let me just say that, while I wasn't a skinny child, neither was my weight excessive (110 pounds, if you didn't figure that out from her chant); at age 12, I hadn't quite reached my full height of 5'5'', and might have been in the 5'1'' or 5'2'' range. A 110 pound woman at that height is tiny. I'm just saying. I despise bullying, in any form, and my so-called friend was a bully. After my family moved from South Carolina to Colorado, things were very different at a new school, with regular clothes (no more matching plaid uniforms, knee socks and saddle shoes) and new friends, especially Sheri. 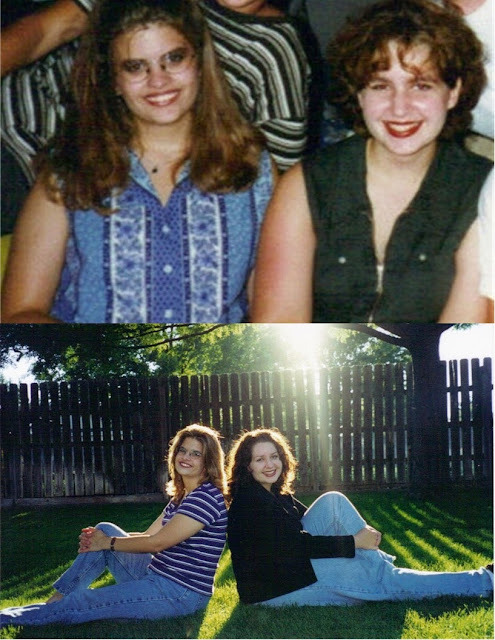 Few weekends went by where we weren't together, hanging out at the park, taking goofy pictures, watching movies all night long, collecting pages out of magazines, working on our tans while simultaneously ruining our hair with Sun-In spray, or discovering internet chat rooms (it was the 90s after all, and I was 16 before I ever used the internet). Or there were the days of just hanging out in each other's rooms trying on clothes, applying makeup, listening to music, experimenting with hairstyles, crying about the boys we liked, dreaming about our future careers, husbands and goals, or sometimes, yes, just reading each other's collections of books without the need for conversation. She never told me I needed to lose weight. Or that an outfit of six different neon colors really did nothing for me. Or that I wasn't going to attract the man of my dreams until I changed something about myself, such as my hair, my body, my style. There was no judgement of each other. No comparison of what size jeans we each wore, who could afford nicer things, who made better grades, who was prettier or more popular. Just acceptance and love. There were the usual ups and downs that teenage girls experience, but it was a good friendship, and one that carried me through high school and into college with a sense of belonging. We have rarely seen each other since the college years - just the busyness of life, travel, jobs, family, and distance getting in the way - so it was a nice surprise to hear from her. The old fashioned way, you know, and not through a text or a status update or a "Like" button. 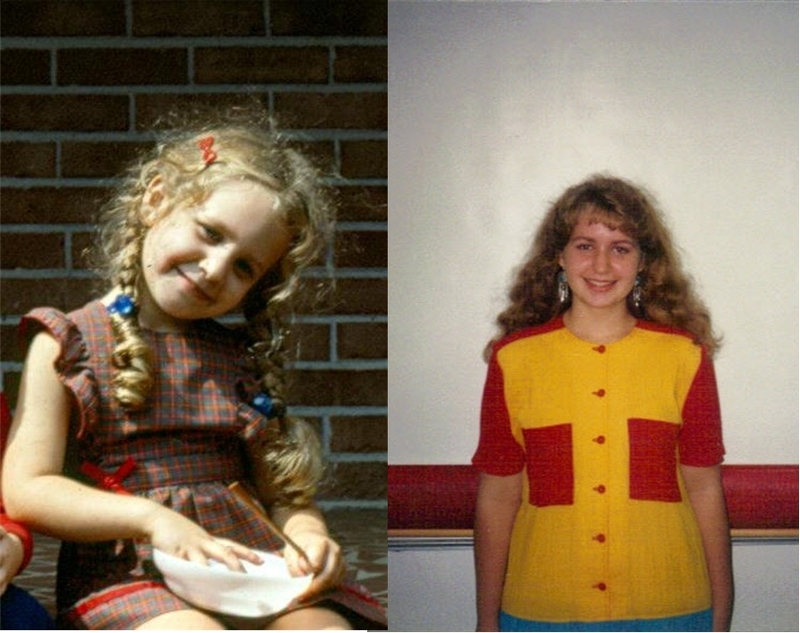 And it was fun to show the photos she sent to Jamie, since he's seen very few pictures of me younger than my early 20s. I guess you could say that for many years, books were my video games in a sense. They were my escape from "real life", and in my mind, everything came alive - the characters, dialogue, accents, settings, clothes - all of it was so very real to me. I felt what they felt, I crushed over characters I couldn't help falling in love with, and became so immersed in what I was reading that it was sometimes hard to put it down and come back to reality. I wanted to be that girl with the long flowing hair, wear a corseted dress, and have a big muscular man come rescue me from whatever predicament I was in. After which, we would kiss passionately and ride off on a horse to his castle. But instead, I was me, and had been led to believe for so long that I wasn't good enough just the way I was. Awkward and shy. Frizzy haired. Told to lose weight or I'd never attract a boyfriend. Hiding in my wardrobe of over-sized plaid flannel shirts and jeans. Uncertain of who I was, who I wanted to be, what I believed or what I wanted out of life. Trying so hard to please everyone and be who they wanted me to be and believing what they told me to believe. Tired of feeling like I had to fight every step of the way to be allowed to cross the threshold from adolescent to adult and decide the course of my own life. It would take crossing oceans, years of living in another country and the chance to have a sense of control over my own life and decisions before that awkward girl grew stronger, more determined, more certain. I was still me, but a me that I could actually appreciate identifying with. A me that was so thankful I hadn't married right out of college like so many people I went to school with, to someone I would inevitably have outgrown, and who surely would not have understood or accepted the changes I still had to make in myself. Not physical changes, but changes within. I didn't understand it myself, at the time, why I was still alone, why I hadn't met "the one", thinking it always came down to simply not being thin enough, not realizing how much personal growth I still had ahead of me. But he was waiting for me all along, even though we wouldn't meet until I was 30. Until I was ready. Until we both were ready for each other. 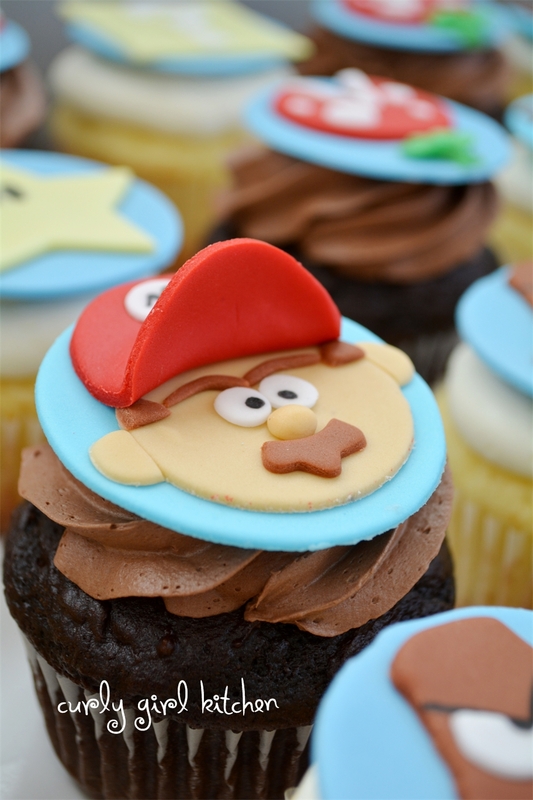 These Mario Brothers cupcakes were for a friend's son who just turned 6, and she told me that he specifically requested that "the girl who's the really good baker" make his birthday cupcakes. Which I thought was just too cute. 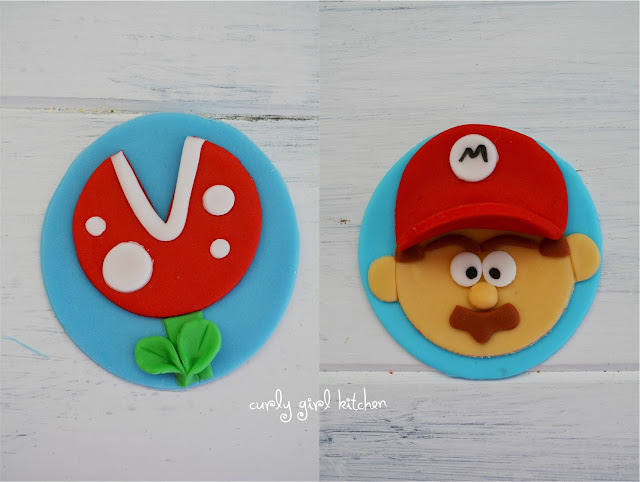 I made the toppers completely from fondant, and I find that the more I work with it, the easier it becomes, although I was quite afraid of it just a few months ago. It's just all part of the process as I learn and become a more experienced baker and decorator. It's reassuring, actually, to look at some of those old photos, to appreciate the years of emotional growth, of discovering that beauty is so much more than what I see reflecting back at me in the mirror, of finding more happiness with every year that passes, of knowing that the best is still ahead. 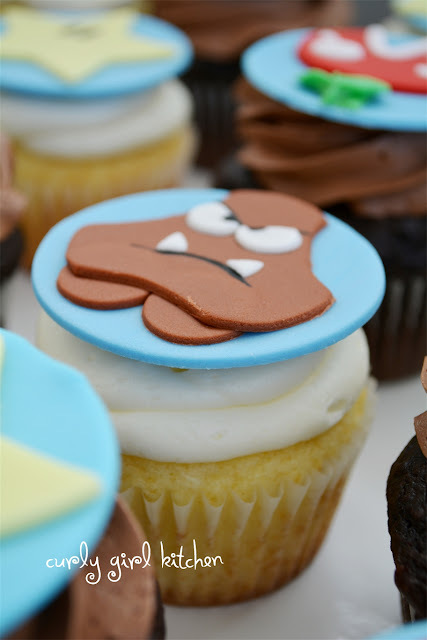 You'll need to make the fondant cutouts several days in advance, so they have time to dry and harden before you put them on the cupcakes. The water is your fondant "glue", since it melts the sugar in the fondant and makes it sticky. To attach pieces together, dip the paintbrush in the water and very lightly brush the pieces that you want to stick together. Press the top pieces gently onto the bottom pieces to adhere them together. The water will evaporate as they dry and harden, and the pieces will be firmly stuck together. Don't use too much water - a drop or two is enough. 1. 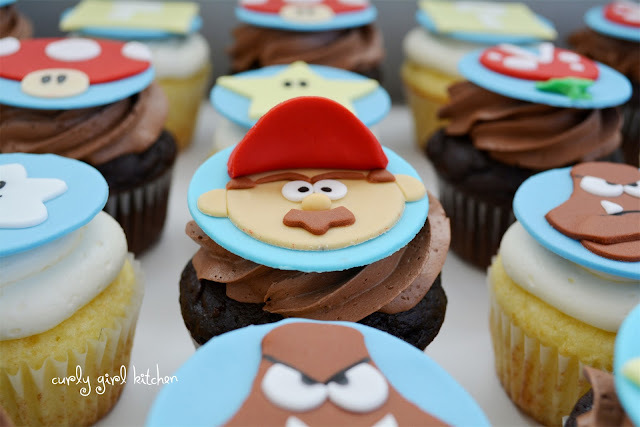 First, color some fondant with sky blue food coloring. Roll it out thin (1/8 inch thick). Cut 24 circles using a 2 1/2 inch round biscuit cutter. Set circles on a parchment-lined baking sheet, and cover with a clean kitchen towel to keep them from drying too much. 2. 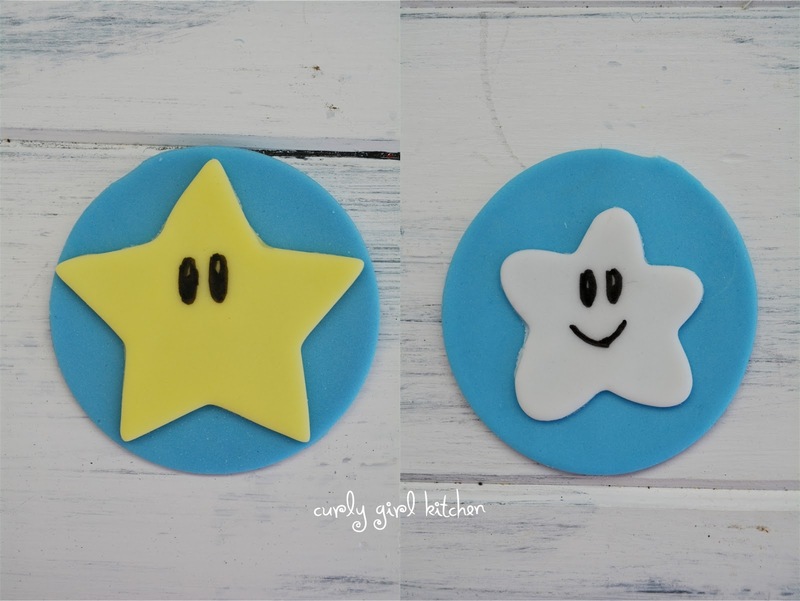 For the STAR, use a star cookie cutter to cut yellow fondant stars. Place the yellow stars on the blue base, using a little water to adhere them. When the yellow star has dried a little, draw on the eyes with the black edible marker. 3. For the CLOUD, use a flower cookie cutter to cut white fondant clouds. Place the white clouds on the blue base, using a little water to adhere them. When the white cloud has dried a little, draw on the eyes with the black edible marker. 4. 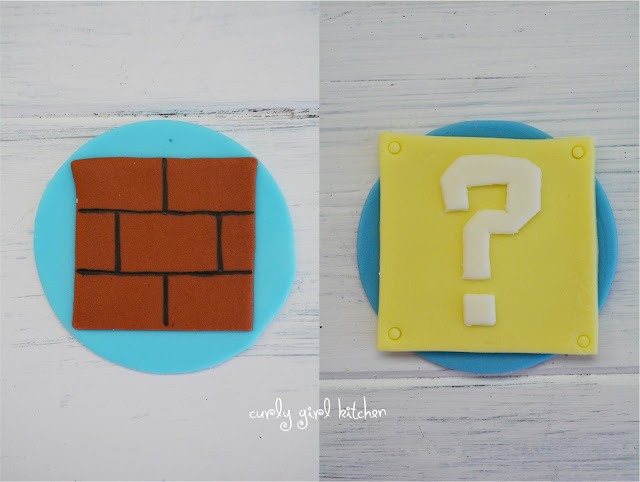 For the BRICK, use a square cookie cutter (or just a sharp knife) and cut squares of brown fondant. Place the brown squares on the blue base, using a little water to adhere them. When the brown square has dried a little, draw on the lines of the brick with the black edible marker. 5. For the QUESTION MARK, use a square cookie cutter (or just a sharp knife) and cut squares of yellow fondant. Place the yellow squares on the blue base, using a little water to adhere them. 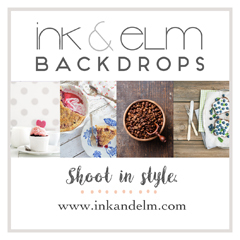 Use a small round piping tip to gently press circle indentations in each corner of the square. If you have a question mark cookie cutter that you like - great! If not, or if you want it to look similar to the pixelated question mark in the game, you'll have to use a knife. I used a small knife and cut the question marks free-hand out of white fondant. Use a little water to adhere the question marks to the yellow square. 6. For the RED MUSHROOM, use a round cookie cutter to cut a circle of red fondant. Roll it out slightly to give it an oval shape. Adhere the red oval to the blue base with a little water. Use the wide end of a round piping tip to cut circles of white fondant for the dots and ivory fondant for the face. Cut some of the white circles in half to place at the edge of the mushroom, with a whole circle for the middle. Adhere the circles with a little water. Once it has dried slightly, draw the eyes onto the face with the black edible marker. 7. 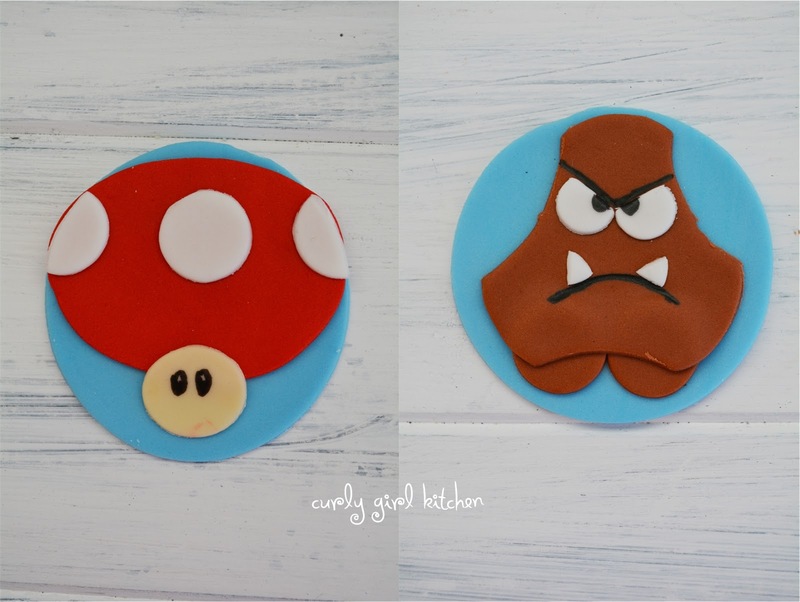 For the EVIL MUSHROOM, use a round cookie cutter to cut a circle of brown fondant for the body, and the wide end of a round piping tip to cut smaller circles for the feet. Use some scraps of white fondant to cut the teeth and the half-circles for the eyes. Take the round body, and use a round cutter to cut out some of the circle around the edges to give him his shape. Adhere the feet to the blue base with a little water, then the body, and lastly the eyes and teeth. When it has dried slightly, draw the mouth, eyebrows and pupils with the black edible marker. 8. For the FLOWER, use a round cookie cutter to cut a circle of red fondant. Use a knife to cut a V shape out of the top. Adhere the red piece to the blue base with a little water. Use some scraps of white fondant to cut the white strip along the V and the dots. Press the white pieces gently into the red. Cut a green stem and adhere to the base. For the leaves, I cut small round circles, then shaped them into leaves with my fingers, using a toothpick to indent the center of the leaves. 9. 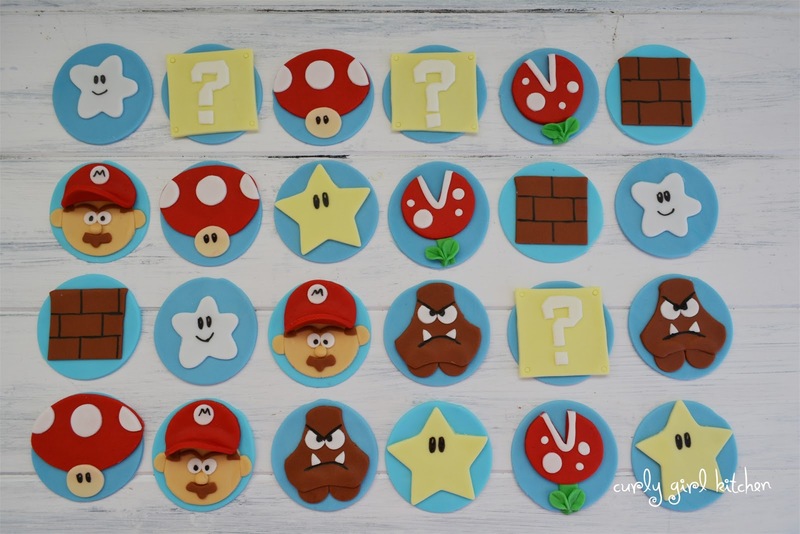 For MARIO, cut round circles out of ivory fondant for his face and ears. Adhere to the base with a little water. Cut small white circles for his eyes and roll a little ivory fondant into balls for his nose. I used a tiny flower cutter for the shape of his brown mustache, and then just used a knife to cut his eyebrows and sideburns. 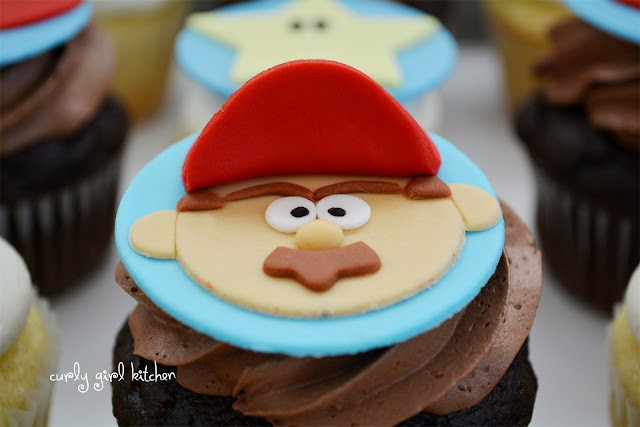 For the hat, cut a circle of red fondant (the same size as his face), and bend one side of it up to form the brim. Adhere to the top of his head with a little water. Add a white circle on the hat, and draw the M with the black edible marker. The design ideas for Mario and the Evil Mushroom are from The Charmed Cupcake, and everything else I designed by studying pictures of the characters.